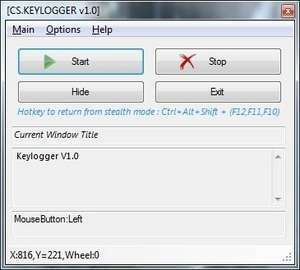 CS.Keylogger (or C-Sharp Keylogger, C# Keylogger) is a very very basic and simple freeware keylogger application released as open source. Information collected from the CS Keylogger is saved as an XML file and unlike more developed programs of this nature, this one does not take screen snapshots nor does it necessarily log what has been copied to the clipboard. This keystroke recorder does, however, support the sending of keylogs to a registered email address, accessible from the main application window. For security reasons, you should also check out the CS.Keylogger download at LO4D.com which includes virus and malware tests. Additional screenshots of this application download may be available, too. CS.Keylogger has a presence on social networks.